The "super-bacteria" are usually found in hospital waste and produce an enzyme, KPC, resistant to antibiotics. Nearly 70% of sewage in Rio - a city of some 10 million people - is spilled raw into the waters of Guanabara Bay. "The problem is that in case of infection it is possible that treatment involves hospitalisation," said Ana Paula D'Alincourt Carvalho Assef, the study coordinator at Rio's renowned Oswaldo Cruz Institute. "Since the super-bacteria are resistant to the most modern medications, doctors need to rely on drugs that are rarely used because they are toxic to the organism," she told the AP news agency. But in June Rio Mayor Eduardo Paes admitted the target would not be met. 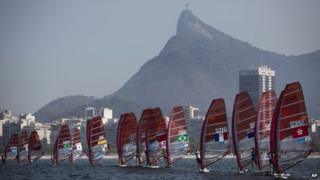 "I am sorry that we did not use the games to get Guanabara Bay completely clean," said Mr Paes. The authorities say they understand athletes' concerns but insist that water pollution will not pose a major health risk during the Olympics, which will be held in August 2016.